Dentures in Brampton. Contact us today for an appointment! A denture is a removable appliance that replaces multiple missing teeth. An impression of your bite is taken here at our Brampton dental office and a custom-fitted denture is created to fill the gaps of your missing teeth. 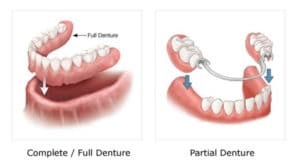 If you are missing one or several teeth, a removable partial denture may be right for you. When you are missing all your teeth, a full denture is indicated. Conventional dentures are one of the simplest, quickest and most cost-effective solutions for replacing missing teeth. However, research has shown that conventional dentures may result in side-effects in the long-term such as gum problems and gradual bone loss. At Northlake Dentistry, we are committed to providing optimal care to all our patients. If dentures are the most fitting solution for you, we will do our best to provide you with the highest quality of denture treatment while presenting you with the adequate instructions for after-care and the necessary follow-up services to ensure your optimal oral health. Contact our office today for a consultation to discuss your options including dental implant-retained denture options.